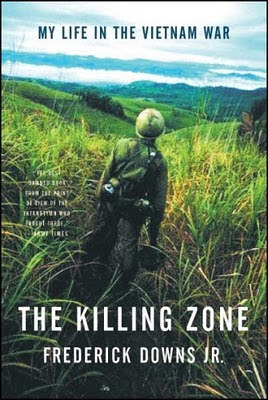 I'm reading a book about the Vietnam War in order to do research for a screenplay. It's weird to think of the book in fictional terms for one second and then suddenly wake up to the reality that the story is actually a report of what happened that day. The words and frustration from unexpected events in the book that are so honest and raw that I find myself just starring at the pages sometimes. The text is full of all kinds of activity but it's hard to ignore the horror, the violence, the death, the non-caring, the sadness, the pointless schedule and the search for something that most of the time – isn't there. comprehend I get stuck on the events that happened to single indivudals. Things such as the pluton finding a young Vietnamese male assuming he is a "dink" only because he is "young". They bring him along, arms tied behind his back. Next, they find an old man in his hooch, which they bring a long as he's got these strange maps at his little desk. They have them walk across the fields while people in the village stare at them. After a couple of hours they reach a base camp. All the sudden, an Officer approaches them. He walks straight up to the men and starts beating them with his fists claiming them responsible for an attack that happened the other night. The men curl themselves into the best position they can as the beating goes on. Later it turns out they were innocent, the old man just being an accountant and the young man a farmer. In another chapter they find a graveyard and gets an old woman and a younger girl to dig out one of the graves to look for weapon. Instead they find the body in which of course the woman and the girl freaks out. The soldiers decide to uncover the bandages to make sure the body isn't an American in which they can confirm afterwards - he wasn't. Afterwards they force the woman and the girl to bury the body again. The unnecessary harassment is an ongoing theme. The orders are clear to set examples to make the villagers feel who is in charge. In one chapter they are shooting into a village, harming a small girl in whom the officer, seeing all the blood, goes "What about her? They should have stayed away". Next they shoot an old woman in the jaw not knowing what to do, they just let her run away into the jungle. They watch as an allied Vietnam soldier sinks the boat of one of the fisherman to set an example – leaving the fisherman on his knees crying. There were women serving in the Vietnam as well. Most people never consider this. They also had the posttraumatic stress but noone allowed them to take it that serious. Sometimes I'm not sure writing a war movie will make this world a better place, I just want it to show reality and be like a museum of the things I wish we would never do again.